Omega-3 fatty acids are a type of polyunsaturated fat. We need these fats to build brain cells and for other important functions. Omega-3s help keep your heart healthy and protected against stroke. They also help improve your heart health if you already have heart disease. Your body does not make omega-3 fatty acids on its own. You need to get them from your diet. Certain fish are the best sources of omega-3s. You can also get them from plant foods. Omega-3 fatty acids should make up 5% to 10% of your total calories. Omega-3s are good for your heart and blood vessels in several ways. They reduce triglycerides, a type of fat in your blood. They reduce the risk of developing an irregular heart beat (arrhythmias). They slow the buildup of plaque in your arteries. They help to slightly lower your blood pressure. These healthy fats may also help with cancer, depression, inflammation, and ADHD. Health experts are still discovering all the possible benefits of omega-3 fatty acids. Some fish can be tainted with mercury and other chemicals. Eating tainted fish can pose health risks for young children and pregnant women. If you are concerned about mercury, you can reduce your risk of exposure by eating a variety of fish. If you are middle-aged or older, the benefits of eating fish outweigh any risks. Oily fish, such as salmon and tuna, contain 2 kinds of omega-3s. These are EPA and DHA. Both have direct benefits for your heart. You can get another kind of omega-3, ALA, in some oils, nuts, and plants. ALA benefits your heart, but not as directly as EPA and DHA. Still, eating nuts, seeds, and healthy oils as well as fish can help you get a full range of these healthy fats. Of all plant-based foods, ground flaxseeds and flaxseed oil have the highest amount of ALA. You can eat ground flaxseed over granola or in smoothies. Flaxseed oil goes well in salad dressing. Most health experts agree that the best way to reap the benefits of omega-3 is from food. Whole foods contain many nutrients besides omega-3s. These all work together to keep your heart healthy. If you already have heart disease or high triglycerides, you may benefit from consuming higher amounts of omega-3 fatty acids. It may be hard to get enough omega-3s through food. Ask your doctor if taking fish oil supplements might be a good idea. Agency for Healthcare Research and Quality website. Omega-3 fatty acids and cardiovascular disease: an updated systematic review. www.ahrq.gov/research/findings/evidence-based-reports/er223-abstract.html. Updated April 2018. Accessed July 13, 2018. Mozaffarian D, Wu JH. Omega-3 fatty acids and cardiovascular disease: effects on risk factors, molecular pathways, and clinical events. J Am Coll Cardiol. 2011;58(20):2047-2067. PMID: 22051327 www.ncbi.nlm.nih.gov/pubmed/22051327. 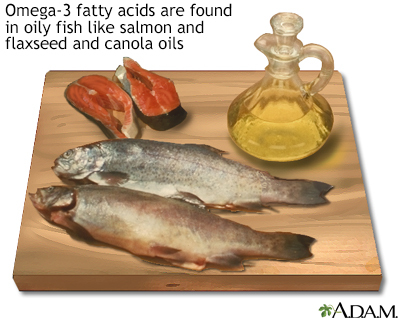 Omega-3 fatty acids are a form of polyunsaturated fat that the body derives from food. Omega-3s (and omega-6s) are known as essential fatty acids (EFAs) because the body cannot make these fatty acids on its own so omega-3s must be obtained from food. These different types of fatty acids can be obtained in foods such as cold-water fish including tuna, salmon, and mackerel. Other important omega 3 fatty acids are found in dark green leafy vegetables, flaxseed oils, walnuts, chia seeds, and certain vegetable oils. Omega-3 fatty acids have been found to be beneficial for the heart. Positive effects include anti-inflammatory and anti-blood clotting actions, lowering cholesterol and triglyceride levels, and reducing blood pressure. These fatty acids may also reduce the risks and symptoms for other disorders including diabetes, stroke, rheumatoid arthritis, asthma, inflammatory bowel disease, ulcerative colitis, some cancers, and mental decline.